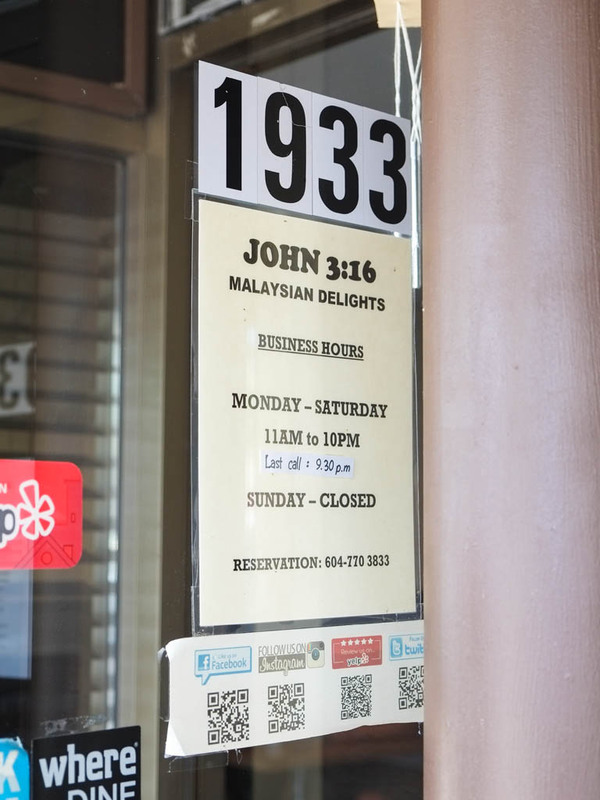 I reviewed the original Richmond location of John 3:16 back in November 2014 (review here) but that location was torn down to make way for a new huge development. Their replacement Richmond location around the corner on No. 3 Road is coming “soon”, but in the meantime they opened their North Vancouver location back in April 2016. 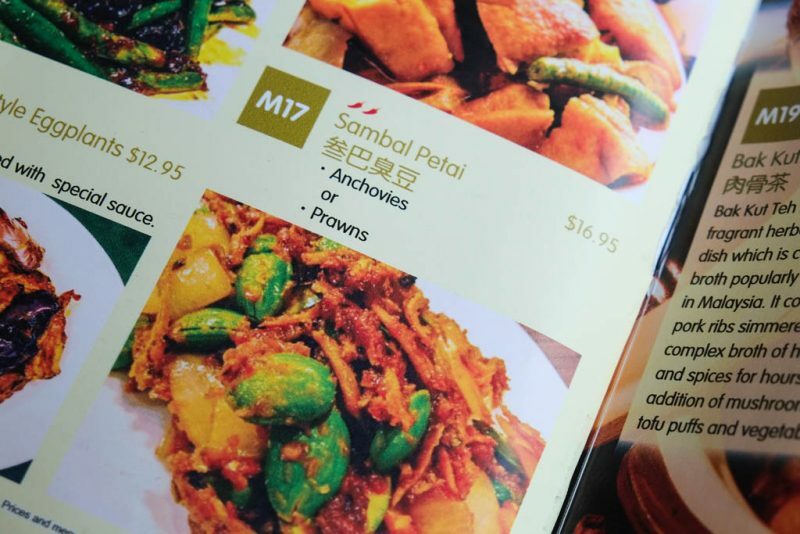 To our surprise and delight, their North Van location has petai on the menu permanently! 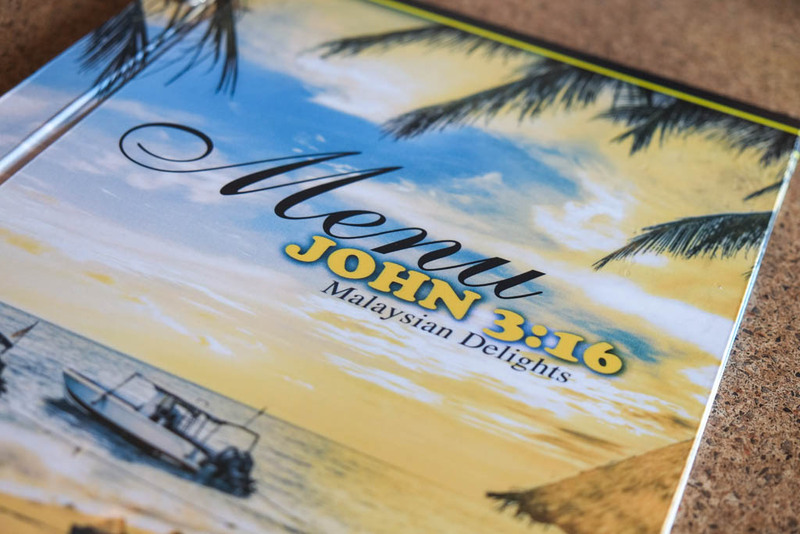 Some people on food review aggregator websites have been complaining about the cost of the Malaysian food at John 3:16. If that really bothers you, then try their weekday lunch specials. If the price still bothers you, have you seen the prices at the newish Penang Bistro on Fraser St.???! 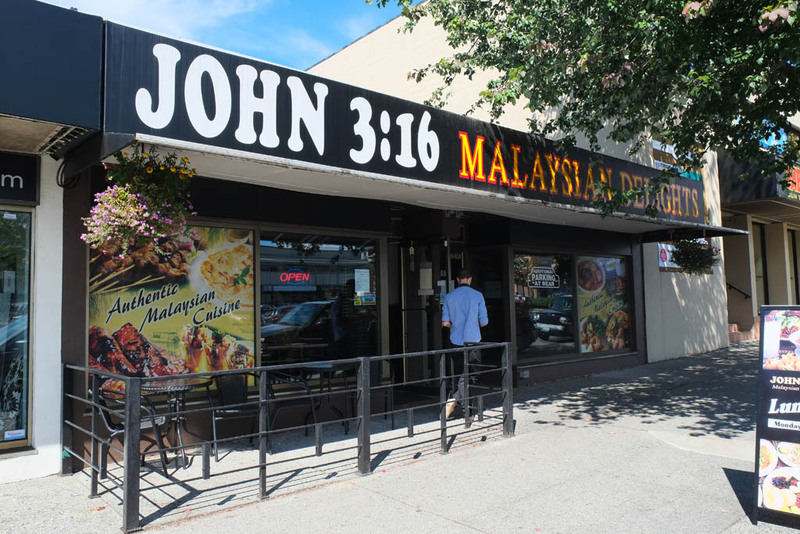 John 3:16 is on Lonsdale Ave., just north of Persian restaurant central! Yaas and Cazba close by! I wonder if that’s the view from Penang, where the owner/chef is from. They’re Hokkien from Malaysia, by the way. Sambal Petai! Happy to see it on their regular menu. Yeah, yeah, yeah, it’s $17 but they have to import the damn beans from Asia, so I’m ok with paying that much for it. We chose the version with anchovies cuz that seemed a bit more authentic, sorta like you’re eating nasi lemak. I was in the mood for a contrasting lighter dish, so Hainanese Chicken Rice felt right for the moment. Their full menu is available online. 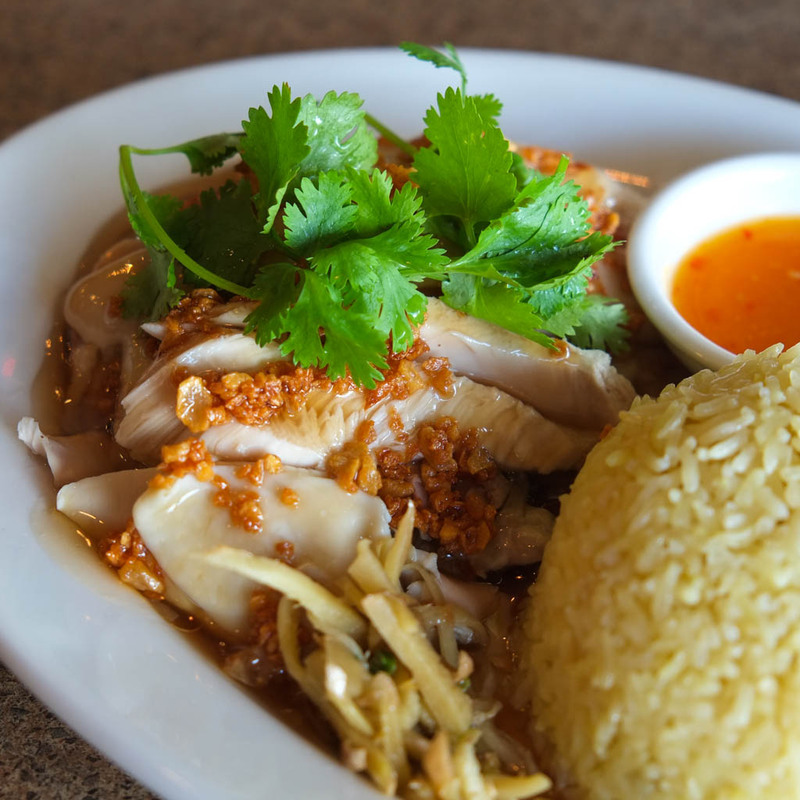 Hainanese Chicken Rice ($12.95). This is their combo version that comes with rice and soup. The chicken has a thick mild gravy on it, along with caramelized fried garlic which I liked against the chicken. Served with a pile of ginger as well, that seems cooked or marinated in some way. Mild, slightly tangy chili sauce. 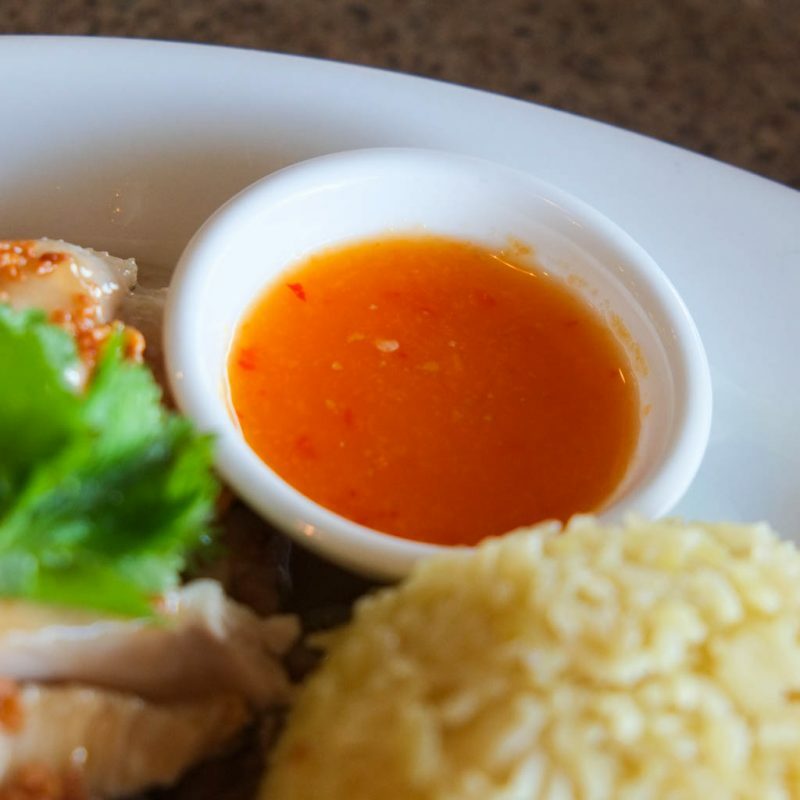 Real Singaporean Hainanese chicken rice would have three sauces: ginger, chili sauce (always a secret recipe), and dark soy sauce. 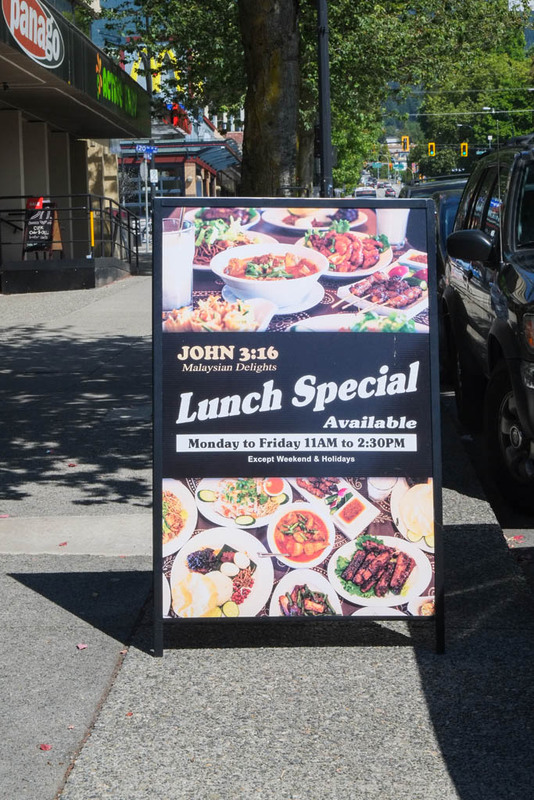 John 3:16’s version has a gravy on the chicken and chili sauce on the side. This might sound nitpicky, but with a dish as “simple” as chicken rice, small details count for a lot. 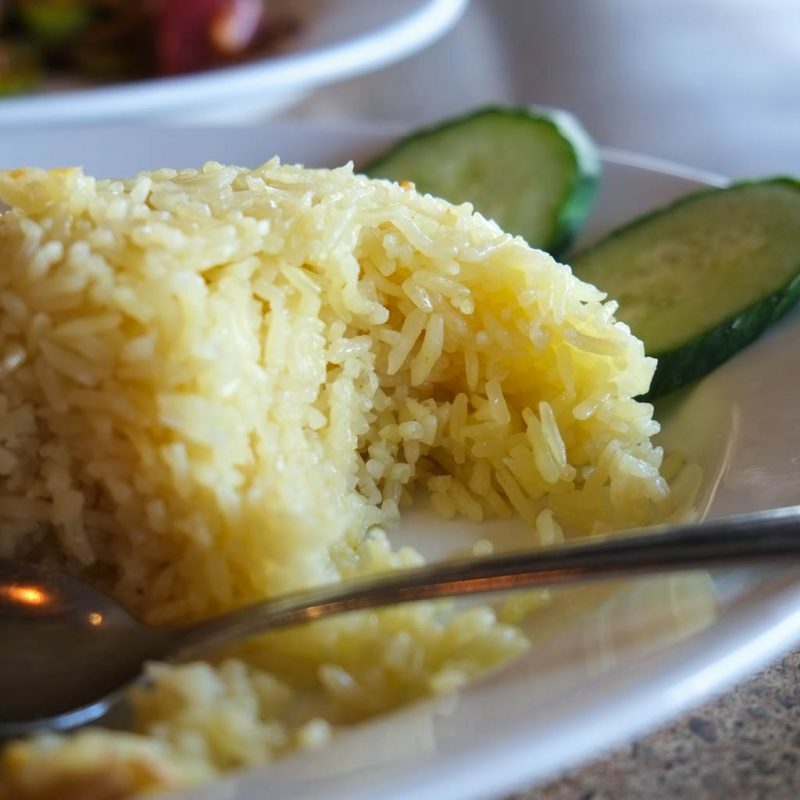 The rice seemed to be more of a tumeric rice rather than a Hainanese chicken rice with chicken broth, chicken fat, and aromatics. Not terrible, just ok. Lacks the fragrance and depth of the best chicken rice. The meat was tender and moist, but if you’re talking “Hainanese Chicken Rice” then this doesn’t measure up to the best because it doesn’t have that layer of congealed goodness underneath a taut skin. 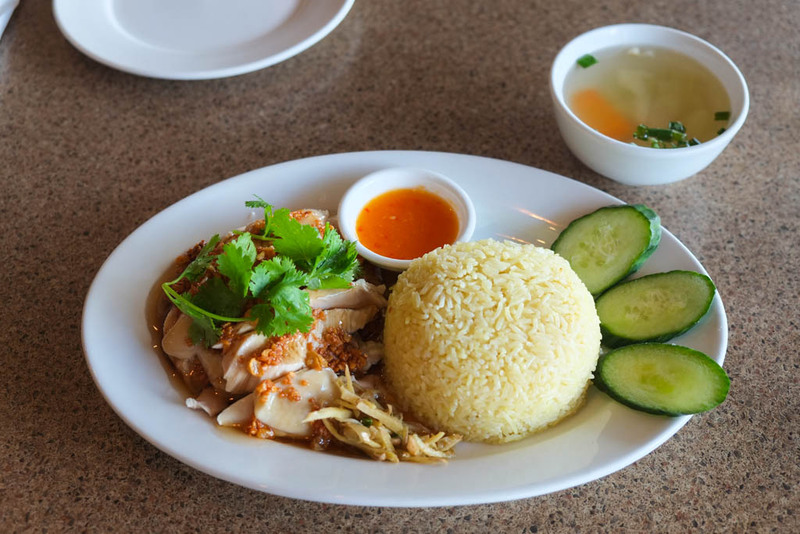 Wicca’s mom’s Vietnamese take on chicken rice would have to be #1 because mother-in-law’s food is always the best no matter what (Wicca’s family is of Hainanese descent from Vietnam). 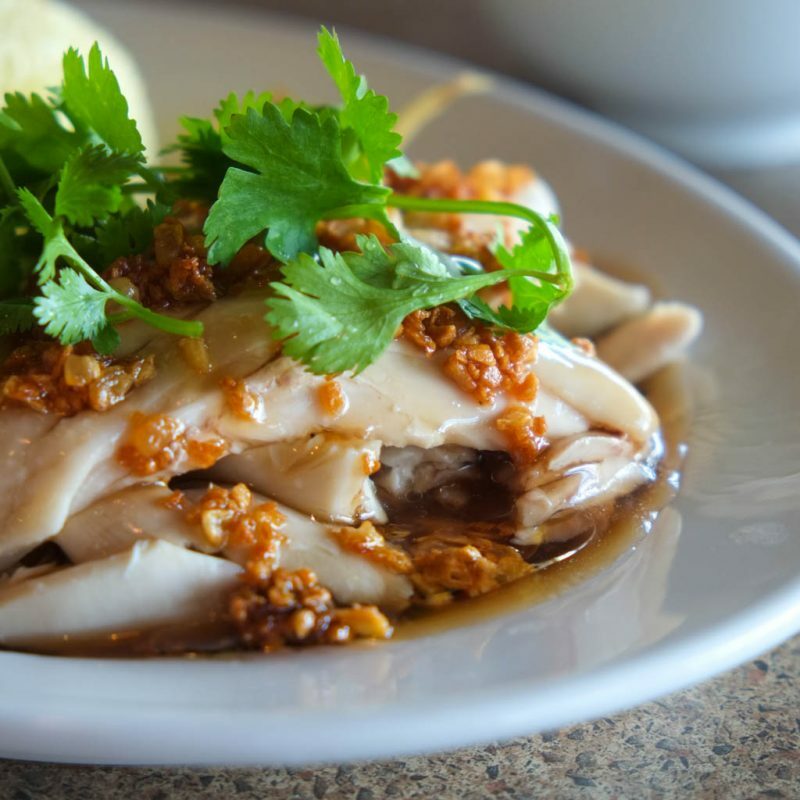 #2 would have to be Tian Tian Hainanese Chicken Rice at Maxwell Road Food Center in Singapore (same place that Anthony Bourdain went to in season 5 episode 1 of No Reservations). 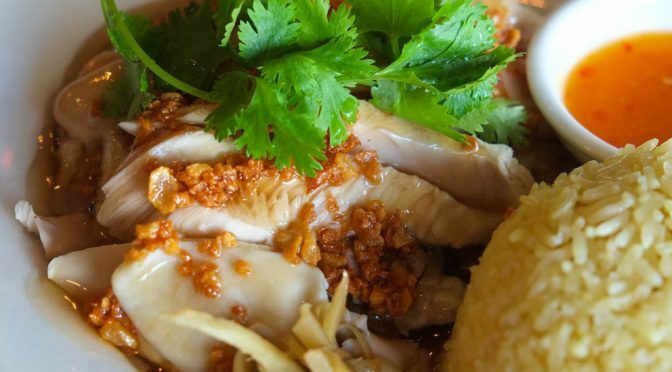 #3 (and probably the best in North America) would be Nong’s Khao Man Gai in Portland, which is a Thai version of Hainanese chicken rice, which excels purely because it tastes so damn good for something so simple and different from the prototypical Singaporean version. John 3:16’s version would have to be judged as good. Nothing wrong or offensive (actually Wicca would beg to differ about the rice), but just not reaching the heights of what’s possible. The chicken rice come with a clear soup with cabbage and carrot. 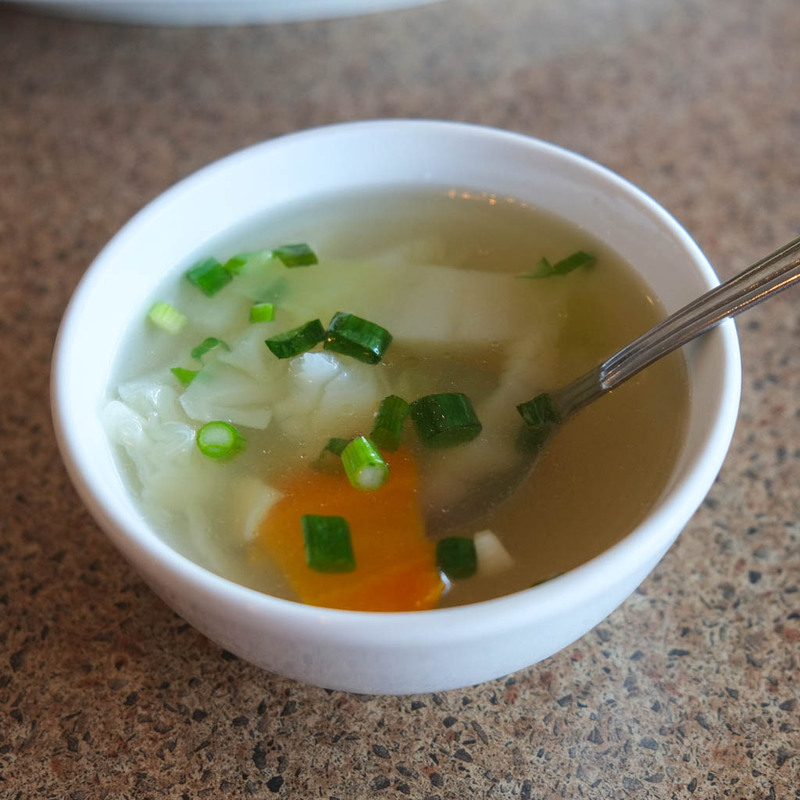 Tasty enough, but the first thing that comes to mind when I taste it is not chicken broth or the essence of chicken. 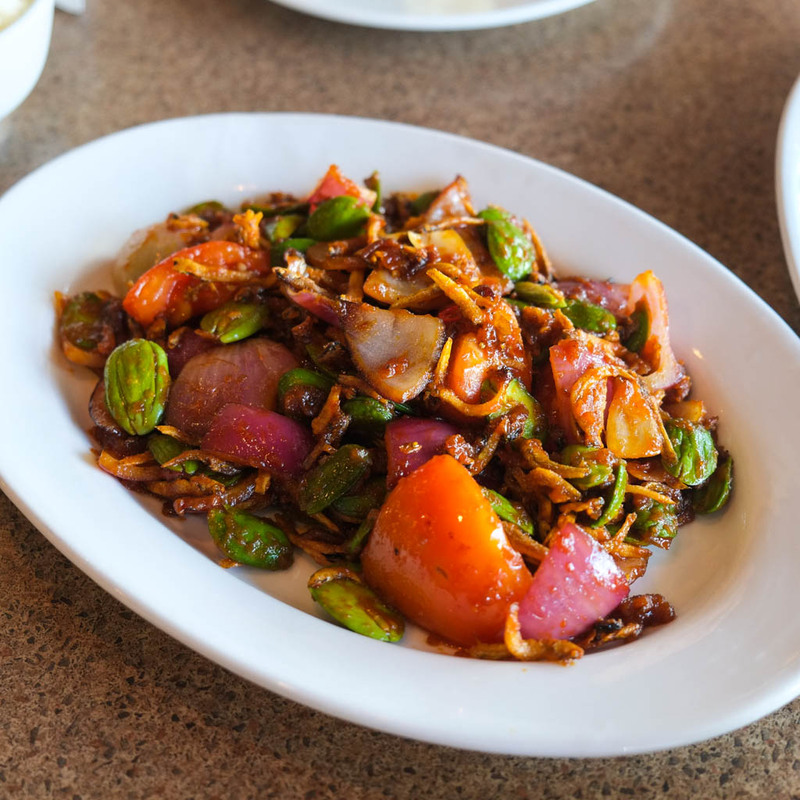 Sambal Petai ($16.95) with anchovies. Comes as an entree, so we ordered a bowl of rice ($2) to go with it. 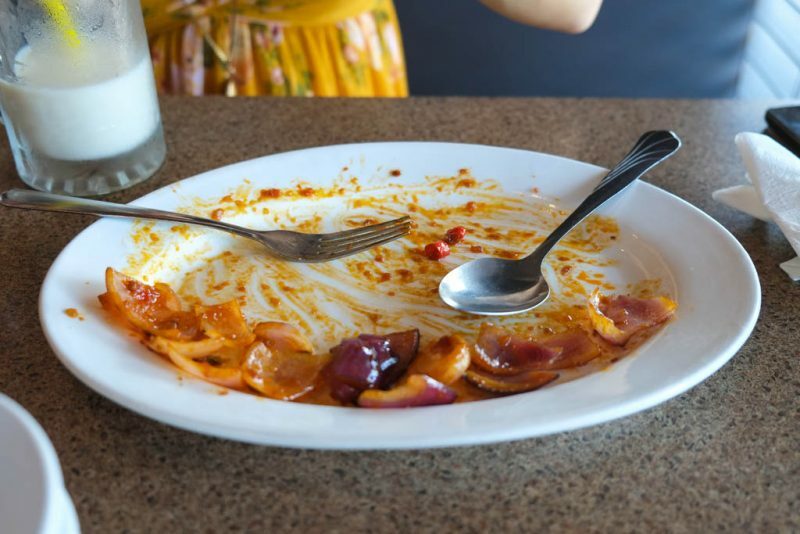 I think we’re addicted to this dish. 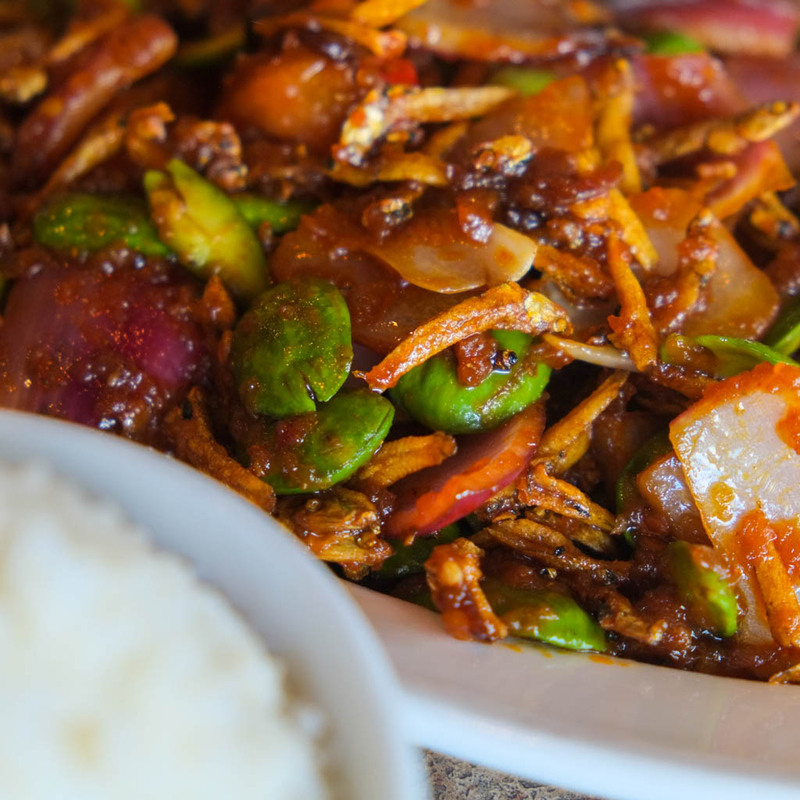 That sambal sauce is punchy, tangy, spicy, sweet, with a bit of funky saltiness. The dried fried anchovies added a slightly salty and crunchy kick. The petai (stinky beans) are like a cross between broad beans and pumpkin seeds, if you were to braise a pumpkin seed, I guess. The actual flavour of the petai is mild to non-existent when covered in sauce but it’s the texture that’s king. And of course your pee will stink afterwards, like when you eat asparagus. The owner’s daughter-in-law recognized me and Wicca from when we used to go to the Richmond location, so she brought us a couple drinks on the house. When Wicca finds food that she loves, she can’t help but talk to the staff about the food and their story. I sit back and quietly observe and listen. 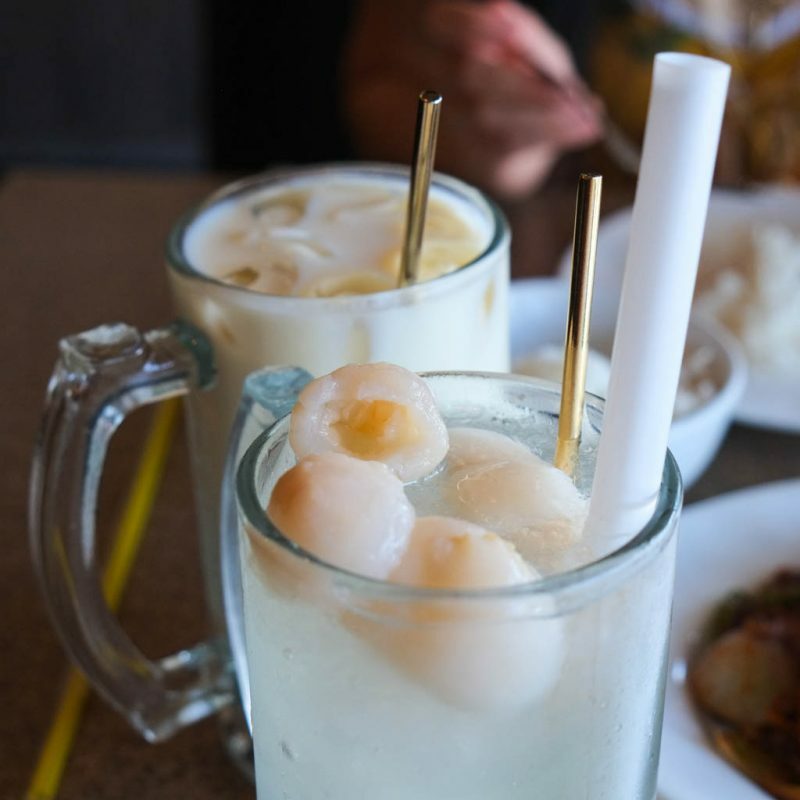 I think these were Iced Lychee Juice ($3.45) and Soy Milk ($3.45) with lychees added. Having lychees in a soy milk was very interesting… Both drinks were cold and great to offset the punchy tang of the petai. 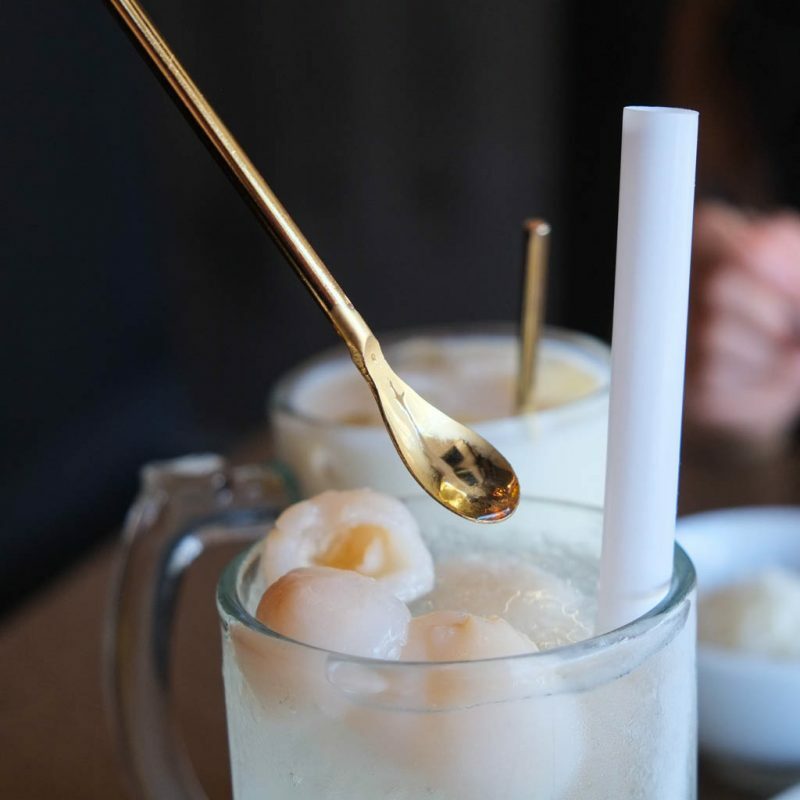 Cute gold spoons in the drinks. Reminds me of ear wax pickers. Wicca hates onions. She’ll use them in cooking but doesn’t like biting into a sulphurous chunk of onion. Are you like that too? Would definitely come back for the Sambal Petai. It’s not a dish that will thrill everybody, but if you like it, you love it! PS. #4 chicken rice would have to go to Freebird Chicken Shack in New West (review here). Now that I work in NV, I sometimes stop by for take out for dinner! 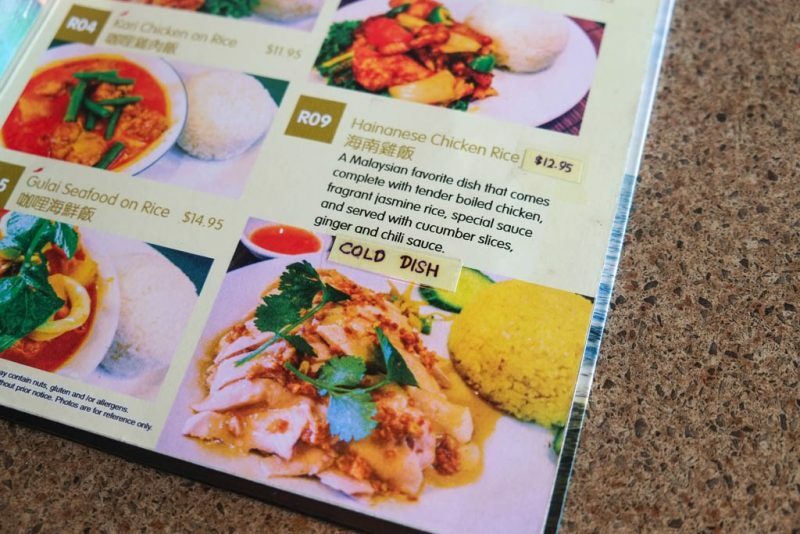 Like you, I also found their chicken rice disappointing once they moved to their Lonsdale location – both the rice and chicken seemed much better before. The chicken was super dry when I got it. I know you guys love the petai beans, but the Koh Loh Mee bit the dust so they could add that! (I don’t know why they can’t just have both…) I wish they would bring back that dish AND keep the petai beans (which I still haven’t tried!). I can’t ever go there without ordering the beef rendang and the pulut pangang. Those are my personal faves there! Everytime I order take out and get the pulut pangang, they know it’s me haha. I don’t think anyone else orders it!